Admiral Michiel de Ruyter's Dutch fleet overpowered Admiral General George Monck's English fleet in a protracted naval clash in June 1666. Admiral General George Monck, first Duke of Albemarle, walked into the great cabin of his flagship Royal Charles with a calm and determined air, tersely greeting his assembled captains before they all sat down at a large table. England was in the second year of what historians would label the Second Anglo-Dutch War, and Albemarle was the co-commander of the English fleet. The Dutch fleet had been spotted about 35 miles east by north of North Foreland, a chalk headland on the Kentish coast of southwestern England. Albemarle called this conference to discuss the next English moves. The admiral had already made his decision but preferred face-to-face meetings so that there would be no misunderstandings. Signal flags, after all, had their limitations, and Albemarle was a soldier and land general who was used to being promptly obeyed. The main issue was this: the English fleet was outnumbered, having detached 20 ships under Prince Rupert of the Rhine to search for the French, who were reluctant allies of the Dutch. Albemarle dispatched messenger ships to Rupert but his exact location was unknown, and he would not be able to render immediate assistance. Monck was fat, so heavy it seemed the chair could barely hold his weight, and at 58 he was often plagued with attacks of gout. Shoulder-length hair fell along his neckline, no courtly wig for him, and his round cheeks were sometimes further distended by a plug of tobacco. Gruff and crude, he had sound instincts and a good sense of naval tactics and strategy. Yet he had only 58 ships against at least 80 Dutch vessels, and the Dutch were led by Admiral Michiel Adriaanzoon de Ruyter, one of the greatest sea commanders of the age. The wind was blowing southwest, which meant that if the English attacked they would have the weather gage; that is, they would be windward, or upwind, of the Dutch. To be upwind was to be on the side from which the wind comes. In the age of sail, this often meant the difference between success and failure. But Albemarle’s captains knew that having the weather gage paradoxically might put the English at a disadvantage, at least on this particular morning. The sea was choppy, its churning surface flecked with white foam, and the winds were blowing strongly. The English ships were heavier than those of the Dutch and carried bigger ordnance. The wind was so strong the English ships were going to heel over on their leeward side, that is, the side that faced the Dutch. Generally, the bigger English ships had little freeboard, with their lower gun decks very close to the water. If they heeled sufficiently, which was very possible, sea water might well flood into the lower decks through the gun ports. The only solution would be to close the lower gun ports, which would deprive the English fleet of more than half its firepower. It was a curious dilemma, but the captains were afraid to voice their objections lest they be branded cowards by their imperious chief. Albemarle decreed that the English would attack without delay. He may have looked like a thick-headed country squire, but appearances were deceiving. The admiral was going to proceed cautiously, but he felt honor-bound to go forward and not cut and run. Perhaps the fates would be kind, and an opportunity would present itself. In the meantime, his fighting instincts rebelled against the idea of turning tail and heading back to the mouth of the Thames River and safety. The date was June 11, 1666, but to the English, who still used the increasingly antiquated Julian calendar, it was June 1. For the next four days the English and Dutch were going to fight one of the longest, and certainly one of the most dramatic, sea fights of the age of sail. 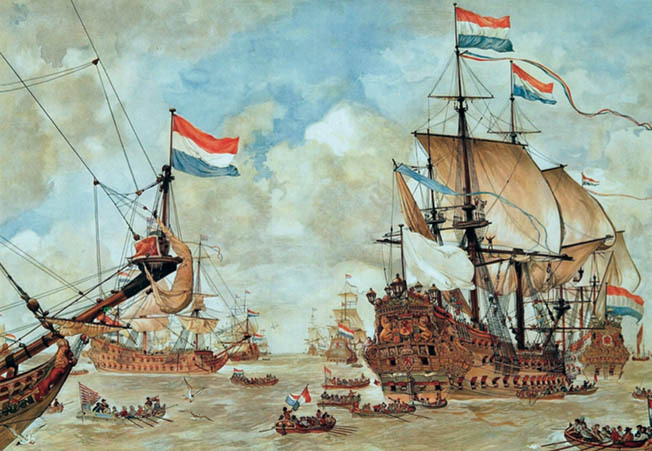 The Second Anglo-Dutch War, like the First Anglo-Dutch War from 1652 to 1654, was basically a contest between two rivals who wanted the lion’s share of the world’s sea trade. Both the English and the Dutch were maritime nations bent on establishing commercial empires on a global scale. Though Britannia did not rule the waves quite yet, King Charles II of England encouraged the growth of overseas colonies and English trading networks. Today the so-called Merry Monarch s best known for his fun-loving ways and many mistresses, but he was a good administrator who took a genuine interest in the Royal Navy. When the war broke out in 1665, the Dutch found an unlikely ally in King Louis XIV of France. Nicknamed the Sun King, Louis XIV was more interested in expanding France’s borders on the Continent but did not want the Dutch to be defeated or the English to become too strong. Though the French played no direct role in the Four Days’ Battle, the threat of Gallic intervention was going to have an influence as time went on. Earlier in the year, Charles directed his brother James (later James II), Lord High Admiral of England, to appoint two joint commanders for the coming campaign. One was Monck. He was instrumental in restoring the monarchy in 1660 after the Puritan Commonwealth faltered. The other commander was Prince Rupert, the king’s cousin and near legendary Royalist cavalry leader during the English Civil War. When the English fleet set sail in late May, Prince Rupert was detached with 20 ships to search for and ultimately intercept the French, who were said to be operating around Dunkirk. Dividing the English fleet was not taken lightly, but it was considered a necessary risk. As Albemarle’s fleet approached the Dutch they formed themselves in line ahead formation, then a relatively new naval tactic. 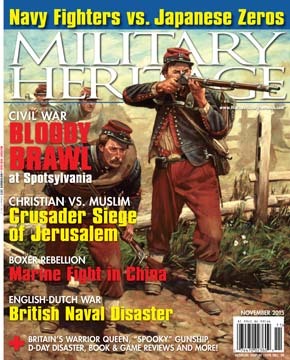 By the mid-17th century there was less emphasis on boarding and more on artillery duels. Since cannons often decided battles, it seemed common sense to line ships up in such a way that they would present a wall of artillery fire to the enemy, pouring broadside after broadside into the foe. As the two fleets closed, Albemarle saw to his astonishment that the Dutch were not moving; indeed, they were at anchor as if it was peacetime. They were scattered in a wide arc in a somewhat haphazard fashion. There were three divisions: a left wing under Admiral Cornelius Tromp, the center under Commander-in-Chief de Ruyter, and a right wing under Admiral Cornelius Evertsen. This was an opportunity too good to miss, even if the English were still technically outnumbered. As events unfolded, Albemarle decided to fall upon Tromp’s division, which was the nearest. If all went well, the English could capture or destroy much of Tromp’s command before de Ruyter or Evertsen could come to his aid. Incredibly, it took the de Ruyter a long time to wake up to the danger. The great warships of the age were slow, cumbersome vessels, and de Ruyter could clearly see the enemy approach for an hour and more. He was not worried until almost the last minute because he knew the seas were rough and would prevent the English from using their lethal lower deck heavy guns. The idea that a much smaller fleet, deprived of its heavy artillery, would brazenly attack a superior force seemed sheer madness. It was Tromp, Albemarle’s intended victim, who woke to the danger first. His first reaction was to look toward de Ruyter’s flagship, the mighty De Zeven Provincien, for guidance. There was no sign of any signal instructions, so Tromp decided he was not going to wait around. He ordered his ship, the Liefe, to get underway at once by cutting its cables. Other Dutch ships followed suit, cutting their cables and following Tromp as best they could. 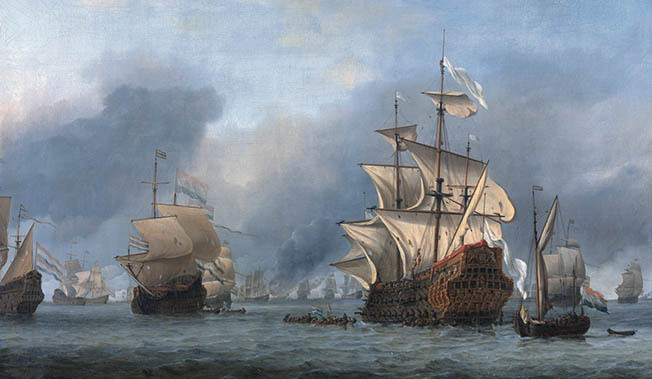 Both English and Dutch ships prepared for the coming clash, which was bound to be bloody. Guns were run out, and gun crews stood eagerly at their battle stations. The captain of each ship dressed in his finest, and among the English such high officers, many of them aristocrats, wore curled wigs. Many of the officers wore slippers instead of boots because it was easier for a surgeon to treat leg wounds that way. Seventeenth-century ships were rarely silent as a battle approached. Men would lustily cheer or hurl curses at the enemy, perhaps even shaking a fist or two through the gun ports. Drums beat a lusty tattoo, and trumpets blared brassy notes. The action formally began about 1 PM, Friday, June 11. Tromp and his ships moved to the southeast with the English White Squadron keeping pace in a running fight. Because of Tromp’s quick-thinking maneuver, he left most of the English Red and Blue Squadrons in his wake. In other words, Albemarle’s plan of concentrated fire against him had failed. The two sides traded broadsides for the next three hours, but little initial damage was done. The Dutch wanted to employ their fireships but were frustrated because they could not get them into action against the wind. The heavy swells and violent winds also affected the course of the battle. The English were trained to fire on the down roll of their ships, with enemy hulls the prime target. Unfortunately, the choppy water often meant English cannonballs fell short, plowing the sea before disappearing under the waves. In similar fashion, the Dutch were not having much luck, either. They tended to fire on the unroll, their target a ship’s ropes and rigging. The idea was to cripple an enemy vessel’s maneuverability and leave it helpless for possible boarding and ultimate capture. But once again, an impartial nature worked against human desires. The rough seas caused many Dutch cannonballs to go over, missing their targets completely. Albemarle’s planned assault on Tromp unraveled as more and more Dutch ships came up to join the fight. Before long the numerical advantage passed to de Ruyter, but then Admiral Evertsen and his ships gained the wind by passing through a gap in the English Blue Squadron line. The Blue Squadron was caught between a Dutch crossfire with Evertsen on one side and de Ruyter on the other. When Albemarle saw what was going on, he took decisive action by tacking; that is, turning around, to render Blue Squadron some assistance. The admiral was in the center with the Red Squadron, but it was obviously impractical to turn in battle order, white, then red. The White Squadron in the van was miles ahead, and it would take too long to turn ship by ship in succession. As his flagship Royal Charles turned about, other members of the Red Squadron did the same, following in its wake like ducklings dutifully following their mother. It was around this time, about 5 PM, that the Dutch encountered some problems. The 58-gun Hof Van Zeeland caught fire, though there were no English fire ships in the vicinity. The crew courageously fought the blaze, but strong winds fanned the flames and created a raging inferno. The fire spread so rapidly that the vessel was consumed from stem to stern within a short time. The seas were still very rough, but when all hope was gone the crew abandoned ship and plunged headlong into the water. Nearly all of the 248-man crew perished from drowning. And that was not the end of the calamity because another Dutch vessel, the 46-gun Duivenvoorde, also caught fire. The Duivenvoorde had a delegation of French observers aboard, including three blue-blooded members of the French aristocracy: Louis, Prince of Monaco, his brother-in-law Armand de Grammont, and the Sieur de Nointel. The searing heat from the flames drove the helmsman from the whipstaff, yet the sails were still largely untouched and continued to billowed. That meant that the ship was essentially out of control, a menace to friend and foe alike. The worst Dutch fears were realized when the blazing Duivenvoorde collided with the Klein Hollandia. The Klein Hollandia was locked in the Duivenvoorde’s fiery embrace, and the fire started to spread. Klein Hollandia’s crewmen frantically took axes to chop away burning debris to free their ship, but after a few minutes it looked like it would be consumed. While the Klein Hollandia crew worked, crew and passengers on the Duivenvoorde crowded the beakhead (the protruding front section of a sailing ship), taking their turns climbing over the bowsprit, then jumping down to the Klein Hollandia’s relatively safe decks. About 30 of the crew made it, including the three French aristocrats. The Prince of Monaco, who had earlier been wounded in both arms and fallen into the water, was said to have been rescued when someone pulled him aboard by his hair. But not all of the Duivenvoorde’s crew made it. When the flames hit the magazine, the ship exploded with a mighty roar that sent flames, smoke, and debris high into the air. About 170 crew perished, including Captain Otto van Treslong. The casualties included eight members of the French delegation. But how did the Dutch ships catch fire? Strong circumstantial evidence points to English incendiary shells, which are hollow brass balls filled with flammable material. The Prince of Monaco said that the enemy “threw some rose-colored balls and these, remaining on board, expanded and started an inextinguishable fire.” Dutch Captain Hendrick Hondius mentioned “a fiery bullet from the enemies.” Records show the English did have “120 Fire-shott” that eight ships shared. In the meantime, Albemarle’s Royal Charles did succeed in taking some of the pressure off the Blue Squadron, though at heavy cost. It traded broadsides with Zeven Provincien and other Dutch vessels, but by the time it ended its rescue run it was badly cut up. It was recorded that the “Dukes sailes were torne to the yards in peeces.” The Defiance was also badly damaged. In the 17th century it was common practice to anchor and repair a damaged ship as best as one could on the spot. Once repairs were affected, a ship would be ready to resume fighting. The Royal Charles got out of harm’s way, at least for the moment, then anchored. The torn and shredded sails were replaced with new canvas and other repairs were put in place. Other ships followed suit, and even some of the Dutch ships refitted as best they could. But this lull, which lasted about an hour, was not universal. A terrible commotion could be heard toward the southeast. The White Squadron under Vice Admiral Sir William Berkeley was in serious trouble. Before Reiger could fully comply with the order a second Dutch ship, the Calantsoog, came up and gave Swiftsure a broadside that brought down its main yard and carried away the topsail sheets. Swiftsure, essentially crippled, could not now escape to the main English fleet. Both Reiger and Calantsoog poured broadside after broadside into the hapless Swiftsure for an hour or more. The gallant Sir William was still defiant and refused to surrender to the Dutch. The Dutch were known for their skill at boarding, so Berkeley challenged them to try their luck. Waving his hat, Berkeley yelled, “You dogs, you rogues, have ye the heart, so press on board!” Eventually the Dutch did just that, holding the Swiftsure in a deadly embrace by means of grapples. Dutch marines swarmed aboard the English ship, but the defenders repulsed them with heavy fire. The Swiftsure crew fought hard, but the outcome was a foregone conclusion. When the last defenses were breeched the surviving crew asked, and was granted, quarter. Sir William had died earlier when his neck was pierced by a musket ball. He had been carried into his great cabin a short time before the surrender. The Dutch found him there, sprawled across a table and covered with blood. An English lieutenant was found dead in Swiftsure’s powder magazine, his hand clutching a knife. From the horrible neck wounds and copious amounts of blood it was plain he had committed suicide by cutting his own throat. According to surviving English prisoners, that man had assured Berkeley that, if the admiral was killed in battle, he would destroy the ship himself. But English crewmen who wished to surrender had no wish to blow themselves up. They threw water on the powder, and when the lieutenant tried to ignite it he found he could not. Cheated of his heroic role, the lieutenant killed himself rather than become a prisoner. Two other English vessels also got into trouble and were captured. The 54-gun Seven Oaks and 42-gun Loyal George apparently tried to come to Swiftsure’s rescue only to be trapped by multiple opponents. After some brief but intense fire both struck their colors. Ironically, Seven Oaks was originally a Dutch ship named Zevenwolden and had been taken by the English only the year before. The sun was already starting to set when the last gunfire was exchanged. Soon darkness brought a reluctant halt to the fight after some seven hours of almost constant strife. The opponents anchored for the night, using this time to pump the bilges, wash the blood from the decks, and begin repairs. The crews on both sides were exhausted, but ships had to be ready for a renewed fight the next day. At 10 PM, English crews could hear the sounds of cannon fire thunder across the inky void. Looking to the southeast, the night sky flickered and pulsed with an almost ethereal glow. It was the sound of an English ship fighting for its life. John Harman, Rear Admiral of the White Squadron, aboard his 80-gun flagship Henry, found himself opposed by at least nine Dutch vessels. And Hartman was right. The Henry’s stout timbers had absorbed a lot of punishment but could stand much more. The ship’s sails were holed and in tatters but could still draw wind, and most of its guns were still in action. But a Dutch fireship drew near and set Henryblazing at the stern. Fire was the thing that seamen most feared, and a score or more of Henry’s sailors panicked and jumped overboard. A few even commandeered the ship’s boat. But Hartman drew his sword, swearing to run through any who ran for the railing. Order was restored, and the Dutch fireship was pushed away with oars and iron levers, but one of its yards fell down and landed on Hartman, breaking his ankle. Henry escaped, and one of its parting shots swept across Walcheren’s quarterdeck and cut Evertsen in two. The second day of fighting assumed a more classic line ahead pattern. English maneuvers were particularly fine, so skillful even the Dutch could not help but express their admiration. The English ships came forward line abreast, with each vessel having a neighbor to its port and starboard, but at a given signal they wheeled about and formed line ahead. It was a dazzling display of seamanship and probably the first time this maneuver was made in a major action. The English now sent in fireships to finish the job. The Spiegel was the first target of this flaming assault, and the Dutch ship was set ablaze, but heroic efforts by the crew managed to save her. The Liefde was not so lucky and became so entangled with a fireship it became impossible to save her. Soon orange gouts of flame spouted from each gunport, turning the ship’s interior into a raging inferno. In the meantime, the Antelope and two other English ships closed in on the Speigel, a large vessel of 68 guns. Speigel’s crew did its best in the unequal contest, but within minutes the ship was reduced to a floating wreck. The ship’s mainmast was over the side, her hull holed with so many cannonballs it seemed a miracle she could still float. Dead and wounded sprawled over the splintered decks, and Vice Admiral Abraham van der Hulst was dead with a musket ball in the chest. This storm was part of de Ruyter’s attempt to rescue Tromp, and it succeeded. As soon as he realized that Tromp was cut off and in trouble de Ruyter turned the massive Zeven Provincien about and led the charge with all the ships he could muster. Tromp and his somewhat battered vessels reached the relative safety of the main body. The fighting continued, but at about 3 PM a Dutch flotilla of 12 ships was spotted on the horizon. Albemarle, seeing this, did a quick survey of his fleet. Only 29 English ships were in any condition to go on with the battle. The English admiral reluctantly ordered his fleet to withdraw. Night fell, and one of the English ships, the St. Paul, was captured that evening. Battered and outnumbered, the English had little choice but to retreat. Rupert had not shown up yet, and discretion seemed the better part of valor. On Sunday, June 16, officially the third day of battle, the withdrawal continued toward the west. The Dutch pursued, but many of their ships were too slow or too damaged to catch up. Nevertheless, the English had gotten the worst of the two-day encounter, and it looked increasingly like a Dutch victory. The Dutch also found that the English ships were like wounded animals; they might be damaged, but they were still dangerous. Larger first-rate ships, such as the Royal Prince and the Royal Charles, had stern ports that featured powerful guns, and enemies followed them at their peril. But then, about 3 PM, Dutch seamen heard cheering from the English vessels. Prince Rupert had finally arrived, and his appearance seemed to bring fresh heart into the English ranks. The two English fleets approached each other, happy to join forces and face the enemy in a united front. But then something went terribly wrong. The Thames estuary is a dangerous expanse of tides, shifting channels, and underwater sand dunes called sands. The three days of fighting, terror, blood, and exhaustion had apparently disoriented many of the English pilots. The two English fleets were separated by the Galloper Sand, an underwater sand bank that stretched in a snaking, ribbon-like dune some three miles long and 300 yards wide. All seemed well because the first ships to cross the sand were smaller, relatively shallow-draught vessels that passed over the Galloper Sand without even knowing they were doing so. The 84-gun Royal Katherine and 80-gun Royal Charles collided with the sand, momentarily stuck fast, but then tore loose and went their way. Royal Katherine struck twice but escaped none the worse for wear. Prince Royal, a 92-gun behemoth, was not so lucky. The ship plowed into the sand and remained there, completely immobile. Those English ships that did spot the Prince Royal’s predicament could do little to help. The tide was at flood, but it still would have taken too many hours to get the ship off, and the Dutch were fast approaching. 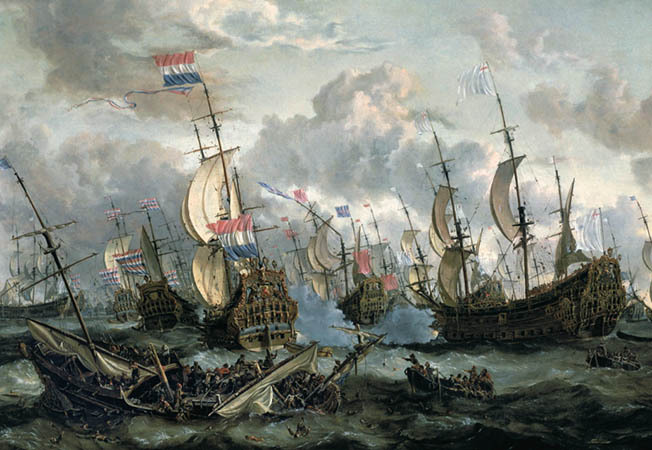 Seeing the Prince Royal in distress, eight Dutch warships swarmed in for the kill. Two Dutch fireships were in the group, preparing to put their vessels to the torch and ram into the helpless English giant. Sir George Ayscue, Admiral of the White, looked on with mounting frustration as the fireships approached his stricken vessel. Prince Royal’s crew began to panic, crowding around Ayscue begging him to strike his flag and surrender. Ignoring their pleas, Ayscue ordered them back to their stations and declared he would rather burn the ship himself than surrender. Soon the crew took matters into their own hands. A seaman identified as a “waterman living at Lambeth, a yellow haired man” hurriedly climbed up the topgallant shrouds to pull down the admiral’s standard. At the same time other seamen hauled down the ensign, a sure sign of surrender. The Dutch were astonished that such a prize would capitulate, but already the crew confirmed the action by shouting for quarter. About 80 crewmen took to the boats and abandoned ship to avoid ignominious capture. Ayscue stayed behind to share the fate of his ship and his men. Jacob Phillips, flag captain of the Gouda, came aboard Prince Royal to accept Ayscue’s formal surrender. Poor Ayscue became the highest ranking sea officer ever to become a prisoner of war. His embarrassment must have been profound, but Tromp and others extended him every courtesy. In the end, the Dutch burned Prince Royal, turning the magnificent ship into a blazing hulk. It was disappointing, but Prince Royal was just too big and had too deep a draught to be used in Netherlands home waters. Tromp was denied the chance to bring the prize home in triumph, but the loss of one of their finest ships was a bitter blow to English pride. The fact that the crew had panicked, surrendering without a fight, made the incident doubly galling. Myngs was on the quarterdeck of his 82-gun flagship Victory. Myngs was soon embroiled in a vicious fight with the new 66-gun Ridderschap. Both vessels unleashed a storm of roundshot, case shot, and chain on each other, and the results were devastating. Marines also scoured the decks with musket balls, one round piercing Myngs through the cheeks. The admiral refused to leave his station on the quarterdeck, though he was bleeding profusely and his jaw and lower face were torn and mangled. He stoically held the shattered remains of his face together with his hands, but when a second musket ball hit his shoulder he was forced to go below. Later, brought back to London, he died from his wounds. The rest of the fighting was somewhat confused. At one point de Ruyter sailed past Prince Rupert to try and attack Albemarle from behind. Rupert tried to parry this move but was rewarded by a series of shots that dismasted his flagship Royal James. The prince’s Green Squadron left the fight and went south, its main duty to protect his crippled flagship. The battle slowly wound down, and it was clear to all that the Dutch had won a victory. The English were at the end of their tether; many ships were perilously low on powder after so many days of fighting. As an added bonus, the Dutch captured four English stragglers: Convertine, Essex, Clove Tree, and Black Bull. The battered English fleet withdrew, this time for good. It retired into a fog bank, and de Ruyter, fearing shoal waters, decided not to pursue. Altogether the English lost 10 ships, the Dutch only four. The fog bank was unseasonal, and de Ruyter interpreted this as God’s work. The Almighty wanted to humble the English and not utterly destroy them. The Dutch defeat of the Royal Navy left England and British shipping vulnerable to attack for the near term. But Monck returned to sea the following month determined to break the Dutch blockade. In the Saint James’ Day Battle fought July 25 he inflicted a stinging defeat on de Ruyter. Tags Anglo-Dutch War, Armand de Grammont, blockade, Britannia, British Royal Navy, Charles II, Cornelius Evertsen, De Zeven Provincien, Duivenvoorde, Duke of Albemarle, Dunkirk, George Monck, Groot Hollandia, Hendrick Adriaanzoon, Hendrick Hondius, James II, King Charles I, King Louis XIV, Klein Hollandia, Liefe, Prince Rupert, Sir George Ayscue, Swiftsure.